Apple is back at it trying to change the narrative that tablets are devices that accompany a laptop and not replacements. 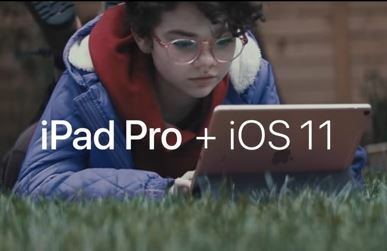 In this new Apple Ad for the iPad Pro, Apple uses a small little girl that has an amazing amount of personal freedom for one her age and shows her using the Apple iPad Pro throughout her little journey around the neighborhood including a small shop where she uses Apple Pay. With many stops along her way she uses the iPad Pro and featured most is the artistic ability of the iPad Pro with the Magical new Apple Pencil. Granted that the power of the iPad Pro and the amazing retina screen that is 10.5 inches as well as supersized 12.9 inch screen allow more content to be provided on the screen. One remarkable shortcoming to the iPad Pro and any iOS device is the lack of mouse support. Apple apparently views the mouse as a signature companion to the computer and in it’s reinvention of the computer with personal pc based devices like the iPhone or iPad it deems the mouse not necessary. And yet the internet has begged Apple for this since the iPad was released. With better peripheral support I do think Apple could displace the computer but the iPad still comes up short in replacing the computer. Previous articleWho exactly are Facebook’s Trust Indicators getting you to trust? Next articleEveryone is tracking you.